We provide funding to plaintiffs and their law firms engaged in large disputes, both in the U.S. and abroad. Our highly-experienced team dives into a case, assessing its merits, providing strategic guidance where desired, lining up experts to strengthen it, and — most importantly — deploy the funding needed to carry the case through to its best outcome. We share risk — we are repaid only if the case is successful — and we promote collaboration among client, law firm and funder. Click Here for our Litigation Finance Form to send us information about your situation. Commercial litigation funding unlocks the value of commercial lawsuits by providing an infusion of capital to business entities and law firms before and after their high-stake commercial claims reach a settlement. This type of financing has existed for many years and is increasingly becoming a mainstream funding solution that helps equalize access to the legal system. The financing supplied by TownCenter Partners LLC is a type of non-recourse debt. We provide financing to the Fortune 500 and to leading law firms around the nation, on a single-case and portfolio basis. The disbursed capital can assist off balance sheet expenses to hide the costs of litigation that can negatively infringe upon company performance. Our promptly available non-recourse financing options start at $10,000 and goes up to Millions of Dollars for The Plaintiff and or Plaintiff Law Firm. Plaintiffs choose litigation as a solution after suffering an injustice. But even though litigation can provide plaintiffs with eventual financial compensation, the long litigation process can make it hard for plaintiffs to struggle with their physical and emotional injuries. And usually, plaintiffs wind up waiting even longer to see the results of their litigation than initially anticipated. A typical personal injury case takes about two years to reach completion, from filing to settlement. Medical malpractice cases or workplace discrimination cases may take even longer. Pre-settlement funding gives plaintiffs a chance to right some of the wrongs that they’ve suffered while litigation is still ongoing. For example, a plaintiff can make up for lost wages, cover medical bills or help cover other expenses that can mount up. Furthermore, a settlement advance allows plaintiffs to hold out longer for a fair settlement as opposed to taking a low ball offer from the defense. Insurance companies and large defense firms are well aware that many plaintiffs involved in serious injury cases are desperate for money. They purposely use delaying tactics to force the plaintiff into taking a much lower settlement offer to maximize their profits. 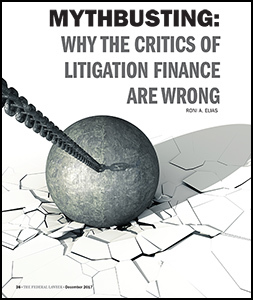 Plaintiff funding tips the scales of justice in the plaintiff’s direction by giving them the financial resources necessary to better endure lengthy litigation. We’re here to provide non-recourse advances for an attorney or firm to fund cases and help protect the rights of clients. Please reach out to us so we may assist.